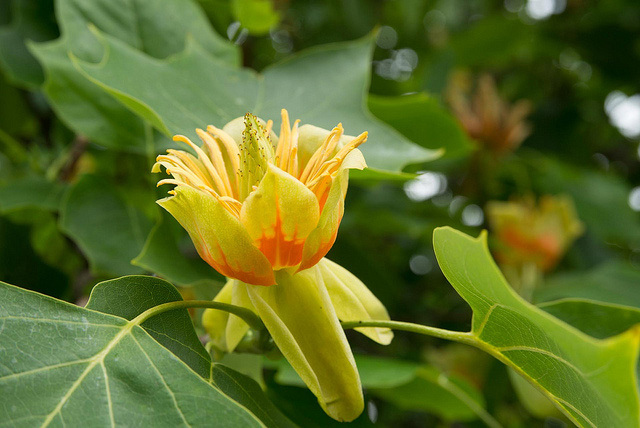 Tulip tree (Liriodendron tulipifera): photo by Kew on Flickr on Flickr (noncommercial use permitted with attribution / share alike). 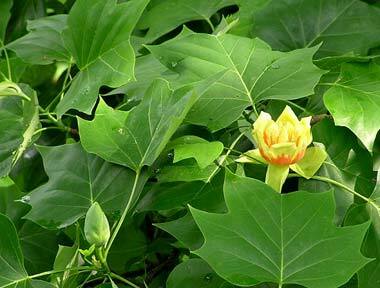 According to the Tennessee Blue Book; "The tulip poplar was chosen because it grows from one end of the state to the other” and “was extensively used by the pioneers of the state to construct houses, barns, and other necessary farm buildings.” Kentucky and Indiana also recognize the tulip poplar as a state tree. Tulip poplar blossom and leaves (Liriodendron tulipifera); photo by Lindley Ashline [MOVED to lindley ♫] on Flickr; noncommercial use permitted with attribution.